Ndemic’s Plague Inc. ($0.99) has seen an overwhelming amount of support since its release in May of 2012. Numerous updates have added new content to the game at a steady pace, and the enormous success of the game has even resulted in a partnership with the Centers for Disease Control and Prevention which saw the game’s creator speak at the CDC as well as some actual CDC-related content for the game. Today Ndemic has announced another partnership, this time with 20th Century Fox that’ll see the Simian Flu featured in the upcoming film Dawn of the Planet of the Apes added into Plague Inc.
As you probably know, Plague Inc. is all about setting a disease free somewhere on Earth and doing everything you can to make the disease spread and eventually wipe out all of humanity. It’s not easy though, as humans are always trying to find a cure for your disease and even simple things like the weather can affect how prolific your disease is. With the Simian Flu, things work a bit differently. The disease causes apes to evolve into super-intelligent beings, and the crux behind Dawn of the Planet of the Apes is the battle between humans and apes for dominance over the planet. So with the Simian Flu in Plague Inc., you’re not actually trying to infect and kill all of humanity per se, but you’re trying to aid the ape species so they can all become intelligent and then take over humanity themselves. It’s a super interesting wrinkle to the normal Plague Inc. formula, and it affords some new gameplay mechanics to the game. For example, you’ll be able to control communities of intelligent apes. As Ndemic explains, “As well as infecting humans, evolve your disease in parallel to allow ape-to-ape transmission and improve their cognitive abilities. Ape colonies will generate DNA whilst helping apes avoid detection from humans." Controlling the apes themselves is just as important–or even more so–than controlling the spread of the disease. Ndemic elaborates on this, “Decide when your apes should rampage against research labs, move apes to avoid detection from military drones and use ape migration to prevent scientists from conducting aggressive ape experiments." It sounds ridiculously cool. 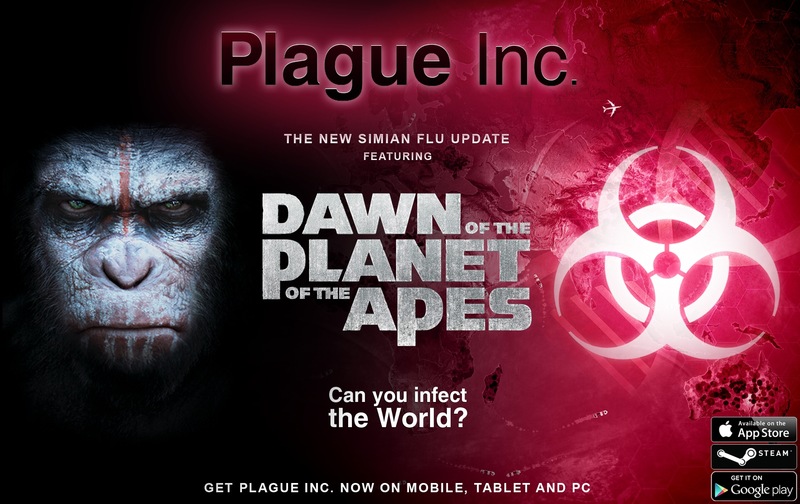 An additional little factoid that Ndemic passed along to us is that the developer was inspired to create Plague Inc. after watching the credits portion of Rise of the Planet of the Apes, which is the first film in the rebooted Planet of the Apes film series. The credits scene shows a disease slowly infecting the world, just like it does in Plague Inc. It’s crazy that just three years later and Plague Inc. is now officially involved with that movie’s sequel. Dawn of the Planet of the Apes is set to open in theaters July 11th, and you can check out the official trailer on YouTube which features a quick Plague Inc. shoutout at the end. As for the Simian Flu update, Ndemic says it’s coming “very soon" and we’ll of course give you a heads up when it goes live.